Blood availability is a great challenge in many hospitals around the world. Many suffer because getting the right blood that is compatible with their body is sometimes hard. Researchers from England have found the means to solve that problem. England is the only nation in the world that has been in the forefront in blood research. The country announced its intent and goals in creating custom blood solutions which is artificial blood. The research proposal put forth by the British National Health Service last Thursday outlines several bold new initiatives. But the one that has people talking now is their commitment to use custom lab-grown blood in two patients within two years. The whole process of manufacturing custom blood from stem cells begins with the extraction of stem cells from umbilical cord blood, and culturing them with adult stem cells. The umbilical cells used are of a specific type known as mesenchymal cells. These cells lack any clearly defined polarity and are typically found cushioned within an extracellular matrix. Depending of their internal programming, and the cues they receive from their surroundings, these cells can develop into connective tissues, bone, or cartilage. They also can become the cells that make up the lymphatic and circulatory systems, as well as those cells that flow through them. In other words, they have everything it takes to become red blood cells reports Extreme Tech. 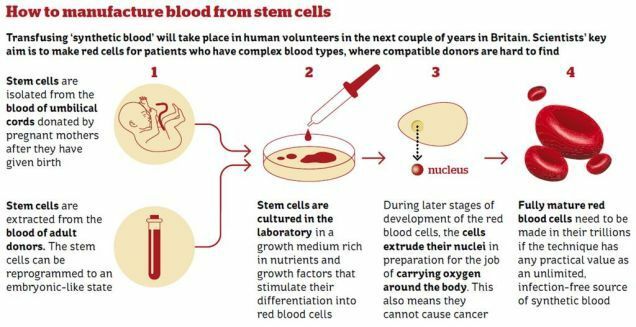 A ready-made supply of special purpose cells would be good for more than just those folks with rare or otherwise complex blood types. It might come in hand, for example, in replacing the blood cells that are compromised in those with rare disorders like sickle-cell anemia. The first major goal of the upcoming clinical trial will be to compare of the survival of the manufactured red cells to that of standard red cells from blood donors. The plan will not be to do a full transfusion right away, but rather first inject just a few spoonfuls to see what kind of reaction they might get. If the procedure is a success many people will benefit from the artificial blood because patients always suffer in the hands of doctors who run out of option when it comes to blood types that are complex. Kenya has fallen victim of high mortality rate caused by lack of blood in hospitals. Last year Siaya Referral Hospital made headlines when three women and six babies died in the hospital due to lack of enough blood in the blood bank. Scientists have made great miles in research and hopefully people will stop crying over high mortality rate and start praising immortality.